Boothe in the 2014 NFL season. Kevin Mark Boothe (born July 5, 1983) is an American football offensive lineman that is a free agent of the National Football League (NFL). He played college football at Cornell University. He was drafted in the sixth round (176th overall) by the Raiders in the 2006 NFL Draft. He has also played for the New York Giants, winning two Super Bowls with the team, both against the New England Patriots. Boothe attended Pine Crest School in Fort Lauderdale, Florida, where he graduated in 2001. Boothe attended Cornell University and was a three-time All-Ivy League selection and a member of Cornell's Quill and Dagger society. Boothe was the first player drafted from Cornell since 1997. He finished the 2006 season as the starting right guard for the Oakland Raiders. Boothe playing in the 2011 NFL playoffs. 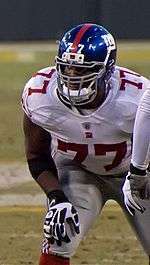 After being waived by the Raiders in the 2007 pre-season, Boothe was claimed by the New York Giants. He won Super Bowl XLII and XLVI with the Giants, both against Tom Brady and the New England Patriots, and he was the starting left guard in the latter game. Set to become a free agent in 2013, Boothe re-signed with the Giants on a one-year contract on March 25, 2013. After becoming a free agent after the 2013 season, Boothe signed a contract with his former team, the Oakland Raiders, on March 17, 2014. The contract was for two years worth $3.4 million. ↑ Thompson, Ed (September 3, 2007). "NFL Roster Moves Tracker". ProFootball.Scout.com. Retrieved 2014-07-21. ↑ "Giants re-sign Kevin Boothe". ESPN.com. March 25, 2013. Retrieved 2014-07-21. ↑ Florio, Mike (March 17, 2014). "Raiders reel in Kevin Boothe". NBCSports.com. Retrieved 2014-07-21. ↑ "Former Giants G/C Kevin Boothe, Oakland Raiders Agree to Two-Year, $3.4 Million Deal".